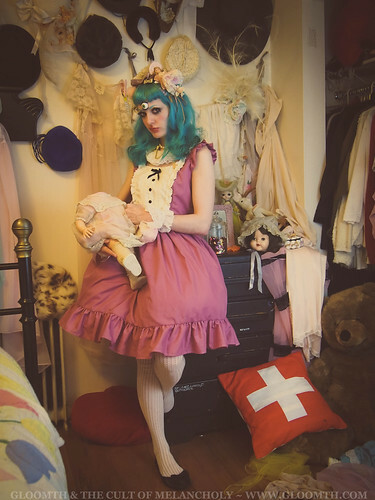 New “Monster Doll Baby” Photoshoot! Introducing our first photoshoot of 2016! I’m so excited to get back to creating these weird glimpses into the Gloomth Universe. This shoot was a lot of fun to create and Vanessa Walsh did an amazing job bringing life to this character! The concept I had for this shoot was “A Monster In My Closet”- the idea of transforming in your private space into your dream self, even if that self is scary or unpredictable, how clothing can effect your personality and make you more fearsome. You might recognize the extra-eye makeup from my Halloween costume (I often test looks on myself before applying them to models during our shoots). 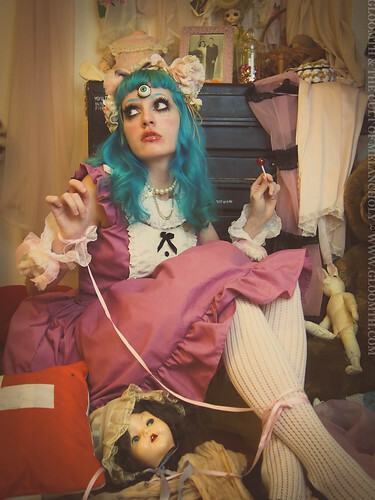 For the rest of the look I stacked cut up eyelashes in heaps around her eyes and used smeary tinted lipgloss to create an unsettling vicious mouth on our monster-doll-baby. For accessories I heaped tons of old toys and weird bits as a crown on her head and matched those to a pair of really tacky bunny-head wrist cuffs. She is wearing our “Mina” dress in rose pink! We had a great time with these photos and you can see the rest in our flickr album! ← Gloomth’s Winter Carnival Tea Party!